As we embark on the 2017 season let’s look back on the accomplishments for 2016. The 2016 season proved to be incredibly amazing with several significant accomplishments. 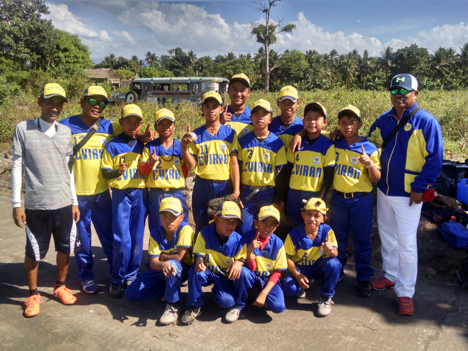 After several seasons of coming up shy in winning Gold at the Central Visayan Regionals, the 2016 Anda boy’s elementary team took Gold and progressed to the Philippines Nationals Series otherwise known as the Palarong Pambansa. The Boy’s team representing the Central Visayan’s (Region 7) made a strong showing and finished with a respectable 7th place out of the 19 competing regions. Pictured below is the 2016 Region 7 Boy’s Elementary Team. In addition, the Anda Girls elementary and secondary teams took Silver at the Central Visayan Regionals losing to Cebu City. Congratulations to everyone on an exciting and successful year! The winner (Cebu City) of the Central Visayan regionals (Region 7) progressed to the Philippine Nationals event. 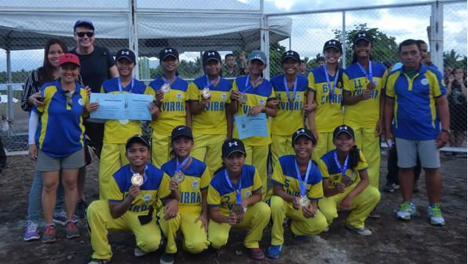 Both the Cebu City elementary and secondary teams opted to draft star softball players from Anda to compete in the Philippines Nationals (Palarong Pambansa) and represent the Central Visaya’s (Region 7). Anda’s elementary players Nathalie Cuadero (SS) and Anadel Pilapil (1B) played solidly during the series making fine defensive plays and crucial hits to help t the Region 7 team go undefeated and win the Philippine GOLD medal! Yes, the Region 7 team took 1st place in all of the Philippines! Congrats to the Cebu City elementary team in winning the GOLD!!! Great job to the coaches, players and the Puerta Princessa baranguay of Cebu City. Pictured below is the 2016 Region 7 (Cebu City) Elementary Team. The Cebu City (Region 7) secondary girls’ team did well this year against some formidable competition placing 7th in the country. The Region 7 team started the series strong beating perennial powerhouse NCR (National Capital Region) but came up short in later rounds. Our two Anda players Kryssa and Rizz were in the starting line-up for every game and making key hits and plays to contribute in the success. Congratulations to the Region 7 girls team for their success! Be sure to check out the Facebook Page and Website for the Anda Braves. We just want to say thanks again to everyone who has donated to our charity on behalf of children in the Philippines.